As a skyscraper must have a physical foundation many stories dig deep in the Earth to support it, so the human mind is built on metaphorical stories buried deep in the psyche, an archeology of human experience layered into our genes, body, mind and brain from millions of years of physical and cultural evolution. Talking to each other for countless millennia about the great and mundane experiences of life – day and night, sky and Earth, mother and father, human and animal, birth and death, love and hate, we built a communal repository of symbols and stories. We assigned and explained the significance of everything - why the sun rises, how turtle found his shell, what true love is made of, and why we suffer. Even scientific theories borrow from stories. We draw from this storehouse of archetypal imagination and meaning in every conversation. Though varying somewhat in style and purpose, fairy tale, myth, fable, parable and legend all weave these great archetypal symbols into the stories we use to understand - or more accurately, imagine to be - the ultimate significance and purpose of the events of our life. In this way, these stories also enfold a religious or teleological intuition of the transcendent significance in the events of life that adds mystery, urgency, and importance to the journey. When someone dies, for example, we say they have gone to a better place, drawing from the universal story of an afterlife held in every culture and religion. Indeed, it is the search for the divinity, and the journey back to our true self and true home, that subliminally drives the universal story. In this bed of collective imagination, each of us dreams an individual life, discovering how the universal story will be experienced as our own. The value of reading fairy tales and related genre resides in their ability to tell us what our life means. Their use of universal symbols awakens the part of us that instinctively understands the language of the image and archetype, potentially releasing personal insights and intuitions of profound significance to the perceptive reader. Traveling down the Road of Life, therefore, it behooves us look to these stories for compass bearings in order to understand “modern” life in general and our own struggles in particular. Fairy tales need not be ancient to carry deep archetypal themes. 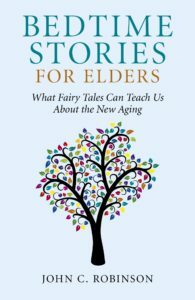 Skillful storytellers use their intuitive awareness of these universal themes, albeit often unconsciously, to create new and equally enchanting tales like those my grandmother told. If a modern tale grabs you - like Charles Dickens’s A Christmas Carol or J.K. Rowling’s Harry Potter, it has tapped the same profound and universal themes of the human psyche. In fact, George Lucas acknowledged that he did not understand what he was trying to accomplish in Star Wars until he read Joseph Campbell’s monumental work, The Hero with A Thousand Faces. The power of these new tales, therefore, lies in their creative use of ancient symbols and we all become depth psychologists as we learn to unravel them. Fairy tales may be approached from three levels - the literal, the symbolic and the personal. At the literal level, we read the story for sheer fun and entertainment. These are often just plain good stories filled with drama, suspense, humor, and sometimes important moral lessons, like the value of industry over sloth in Aesop’s Fable The Ant and the Grasshopper. Our interest here, however, lies more at the symbolic level where archetypes - universally recognized symbols - dwell like mythic creatures in the underground caves of the collective unconsciousness, a realm of the personality Jung believed was common to humans across all cultures and times. Simply put, we all carry the same symbolic forms hard-wired in the unconscious. Mother, Father, Child, Life, Death, Love - the list is long but we intuitively sense what each one means, and the meanings tend to be rich and nuanced. We know, for example, that the Mother symbol expresses the feminine capacity for “tender loving care,” the ability to birth new life, and the prodigious generativity of the Earth, as well as darker forms such as the evil witch or step-mother. But how do we learn to understand the strange, confusing, and fantastic ways archetypal symbols operate in fairy tales? What could a pet goose possibly tell us about aging or a tree growing in a teapot teach us about life? You already know the answer - it’s hidden in your symbolic unconscious - the trick is to find ways to access your own deep knowing. That’s what this book is all about, providing numerous opportunities to tap into this collective wisdom. We are also interested in applying these symbols at the personal level to stir powerful new insights about our own lives. How do the losses of aging initiate us into a new consciousness? What has the dream of my life been about? What would happen if I woke up from that dream? Our task, then, is to learn how to enter the symbolic realm of fairy tales to reveal their hidden meanings and apply them to our own personal experiences. A good place for the avid reader to begin is the work of mythologists and depth psychologists to observe how they use symbols, especially the more accessible works of Joseph Campbell, Allan Chinen and Robert Johnson.